Loss, whether due to radiation leakage or conduction resonance, is a common problem in RF microwave transmission lines, especially when high-powered frequency transmissions are involved. The solution? Waveguides. A waveguide is an electromagnetic feed line used for high frequency microwave signals in high-power transmitters and receivers and is used in radar equipment, in microwave ovens, in satellite dishes or in any RF microwave system where high-power transmission is needed. Waveguides are hollow metallic tubes or light carbon fiber composites constructed with high grade metals like copper, brass, or plated metals. Silver or other plating is used on the inside walls of a waveguide which acts to decrease the resistance loss by shielding and provides efficient isolation between adjacent signals. Transmission lines like microstrip, stripline, or coaxial cable may also be considered to be waveguides and they are usually referred to as dielectric waveguides with a solid center core. However, on high-powered microwave waveguides where the line may get too hot, air in the cavity may be pressurized, recirculated, or a Freon-like gas is used to keep the waveguide cool and also can prevent arcing. While the disadvantages of using a waveguide include a high production cost, large size and mass of the guide, and the inability of running a DC current alongside the RF signal, the advantages in using a waveguide are that they are completely shielded, high-powered transmission lines that provide good isolation and very low loss that can bend without compromising performance. For the signal to propagate, waveguides need a minimum cross section relative to the wavelength of the signal; these cross sections can be either rectangular, circular, or elliptical. The dimensions of a waveguide determine the wavelengths it can support and in which modes. The lowest frequency range a waveguide will operate is where the cross section is large enough to fit one complete wavelength of the signal. In hollow waveguides, or waveguides using a single conductor, transverse-electromagnetic (TEM) mode of transmission waves are not possible, since Maxwell’s Equations demonstrates that an electric field must have zero divergence and zero curl and be equal to zero at boundaries, resulting in a zero field. Comparatively, for two-conductor lower frequency transmission lines, like microstrip, stripline, or coaxial cable, TEM mode is possible. In rectangular and circular waveguides, the dominant modes are designated the TE10 mode and TE11 modes. 3 )Magnetic field lines close to a conductor must be parallel to it. These rules allow for certain modes of propagation such that the TE10 (transverse electric) mode is the mode in which energy propagates in rectangular waveguide. The mode with the lowest cutoff frequency is noted as the dominant mode of the guide. >the waveguide height is half the waveguide width which allows a 2:1 operation bandwidth – having the height exactly half the width maximizes the power inside the waveguide. For convenience, our waveguide calculator provides the cutoff frequency, operating frequency range and closest waveguide size for a rectangular waveguide. 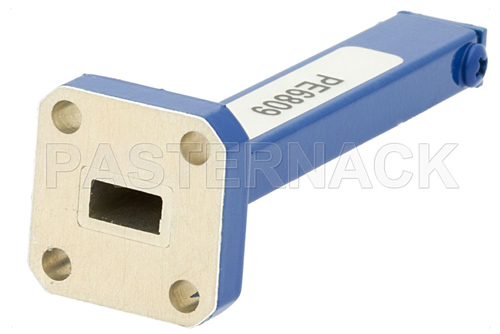 >The double-ridge rectangular waveguide is a type of waveguide used in RF microwave systems. The ridges in this waveguide design serve to increase the bandwidth but, on the downside, creates higher attenuation and lower power-handling capability. >The single ridge waveguide is similar to the rectangular waveguide but noted for its large capacitive loading centered on its broad wall. Compared to a rectangular waveguide, the single ridge waveguide has a lower cut-off frequency with a smaller cross section. However, when compared with the double ridge waveguide, the single ridge yields increased loss and reduced power handling capabilities. >The slotted waveguide, generally used for radar and similar applications, serves as a feed path with each slot acting as a separate radiator. This antenna structure can generate an electromagnetic wave transmission in a specified narrow and targeted direction. When and where are Flexible Waveguides Useful? Coax or Waveguide Interconnect? Which one should you use?